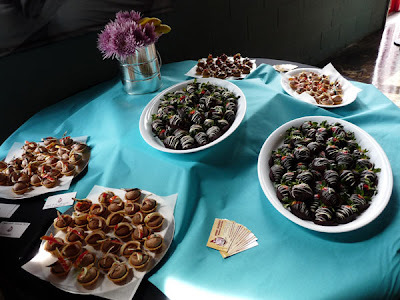 Well, we did some chocolate tarts and dipped strawberries this year for the Bubbles & Sweets VIP lounge at the Palate 2 Palette (benefit for the Craniofacial Foundation). The truffle tarts featured a little white chocolate tuille on top w/ sweet milk chocolate ganache filling w/ a touch of dark chocolate in the shell. And the strawberries were freshly dipped immediately before delivering to the event.